Salbutamol Easi-Breathe Inhaler is a type of inhaler known as a “reliever” inhaler, used by asthma sufferers to prevent an asthma attack. Asthma is an illness which affects your ability to breathe fully and properly, especially when you are exerting yourself, for example during exercise. Although there are varying degrees of severity among asthmatics, any level of asthma can be an inconvenience to daily life. Having a Salbutamol Inhaler relieves the symptoms and makes the chances of you having an asthma attack far less likely. If you need to buy a Salbutamol Easi-Breathe Inhaler, you can buy one online safely from a UK doctor such as Doctor-4-U by completing our simple medical questionnaire and getting a certified prescription. It will be dispatched within 24 hours. Do you know how and when to use your inhaler? Have you called an ambulance or had emergency treatment for breathing problems in the last year? Do you use your inhaler more than four times a day? Have you had your asthma reviewed by a doctor or nurse within the last 12 months? Have you been prescribed Ventolin (salbutamol) in the last 12 months? Do you have an allergy (hypersensitivity) to Ventolin (salbutamol) or have you had a reaction with an asthma inhaler previously? Do you understand that you must seek medical attention if your asthma does not improve within 1 hour of using your inhaler? The Salbutamol Easi-Breathe Salbutamol Inhaler is a type of “reliever” inhaler used to prevent and reduce the severity of an asthma attack. The active ingredient in the inhaler makes breathing easier by widening the airways, and by doing so can make living with asthma easier. You need a prescription from a GMC/EU certified doctor in order to buy this medication online. To buy a Salbutamol Easi-Breathe Inhaler from Doctor-4-U, simply complete our online consultation and if you are deemed suitable, we will dispatch your medication usually within 24 hours. If you are not deemed suitable for an inhaler, you will receive a full refund. Do you need a prescription for a Salbutamol Easi-Breathe Inhaler? Yes, you need a prescription from a GMC/EU certified doctor in order to buy a Salbutamol Inhaler online. With Doctor-4-U’s easy consultation process, you can get a prescription for a Salbutamol Inhaler safely and quickly. Select the item you want to buy, click “Start Consultation” and fill out the short medical questionnaire provided. If you are deemed suitable for your prescription, it will usually be dispatched within 24 hours. If not, you will receive a full refund. What is the difference between Ventolin and Salbutamol? Chemically, Ventolin and Salbutamol are the same drug. They both contain the same amount of the same active ingredient (salbutamol), and each inhaler has the same amount of “puffs” available. The only difference is that they have different brand names on them, which makes the costs vary. There is no difference in side effects, dosage, interference with other medications between the two products. However, if you have previously been taking one type, and are taking multiple medications that mean you may get them confused if you changed the name/packet type of your inhaler, you may wish to continue taking this one. You may also find that one is easier to use or hold. How does the Salbutamol Easi-Breathe Inhaler work? 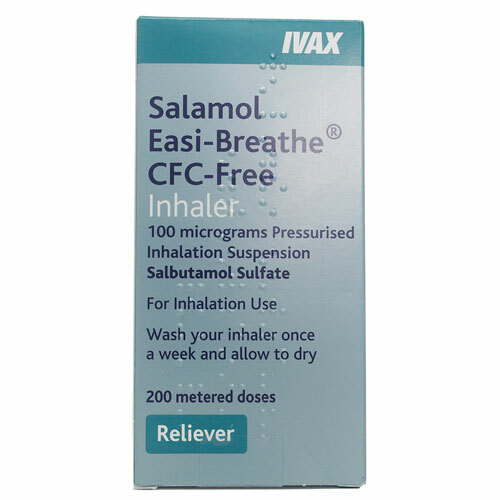 A Salbutamol Easi-Breathe Inhaler contains an active ingredient called salbutamol. This relieves the symptoms of asthma or tight chestedness by opening the airways and allowing you to breathe more easily.It reduces the chances of you having an asthma attack. Is the Salbutamol Easi-Breathe Inhaler suitable for me? Although the Salbutamol Easi-Breathe Inhaler is designed for those suffering from asthma, your medical history and other medications may mean it isn’t right for you. What are the side effects of using a Salbutamol Easi-Breathe Inhaler? The recommended dose of from a Salbutamol Easi-Breathe Inhaler to relieve symptoms of an asthma attack is one puff (100mcg), which may be increased to two puffs if deemed necessary. If you are using your Salbutamol Inhaler before exercise to prevent having an asthma attack, the recommended dose is two puffs, which may be increased to four puffs. Speak to your GP if you are using your inhaler more than 3 times a week. Inhale ONE or TWO puffs when required up to four times per day. If using more than 3 times per week please book an appointment to see your GP.